Remove the outer leaves from the Brussels sprouts and cut them into two halves. Smaller sprouts can be left whole. In a skillet, heat the oil over medium heat and add the sprouts. Increase the heat to medium-high and add the wine. Let them cook over medium heat for 5 minutes or until the sprouts are tender. Stir constantly so they don’t stick. Add salt and pepper to taste. Add the butter and maple syrup. Stir well and serve immediately. 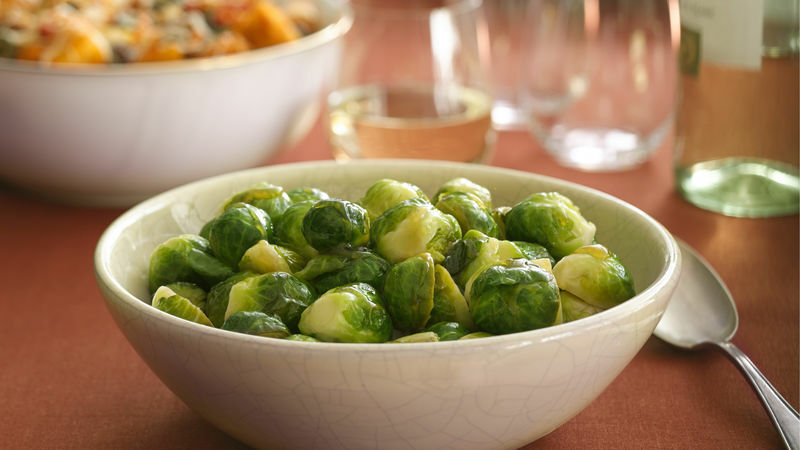 Erica Dinho This delicious Brussels sprouts in maple glaze recipe is a wonderful alternative to add to your next menu as a side dish. The best thing about this recipe is that it's very easy to make. Brussels sprouts aren't appreciated enough, but I guarantee you will love them when you make them this way. I like to sauté them, without cooking them first, because their texture is better. The wine and maple syrup give them a great taste!